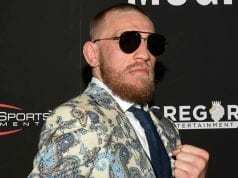 The age old MMA (mixed martial arts) vs. Boxing comparison is not lost on UFC 189, as headlining star Conor McGregor recently called out boxing great Floyd Mayweather. Hot off his rather disappointing, yet one-sided win over fellow legend Manny Pacquiao, ‘Money’ Mayweather will undoubtedly go down as an all-time great, even with his less than savoury reputation outside the ring. His ability to make money is uncanny, and the multiple weight boss reportedly made in the region of £220 million for ‘MayPac’. Jeff Mayweather, a former IBO Junior Lightweight champion himself, clearly isn’t buying in to the McGregor hype shares that the UFC has been doling out, but the likelihood of this fight happening is so small anyway. The fact remains though, if the promotion that houses McGregor wants to make money, just like Mayweather does, and Randy Couture can fight James Toney, there’s always that lingering possibility. ‘The Notorious’ will face ‘Money’ of a different kind tonight though, as he takes on NCAA wrestler and Team Alpha Male beast Chad Mendes in the main event at UFC 189. Stay tuned to LowKickMMA throughout this epic fight day!